Next time a tourist to India wanting to visit Mount Abu and then wants to drive down to Gujarat, he will not be required to contact tour operators in Gujarat separately. The Indian Times reports that tourists can contact either the Gujarat Tourism Department or the Rajasthan Tourism Department to assist in making arrangements, irrespective of the state the traveler wants to visit, thanks to a promotion of interstate tourism. In order to bring in tourists to Gujarat and to market its sight-seeing places, the state tourism department has entered into a pact with Rajasthan, Karnataka, and Punjab for interstate tourism. It has already started selling North Gujarat with Rajasthan. The department is promoting Shamlaji, Kesariyaji, Udaipur, Chittorgadh, Haldighati, Nathdwara, Charbhuja, Ranakpura, and Mount Abu in Rajasthan, along with Ambaji, Kumbharia, Modhera, and Bahucharaji in Gujarat. Officials said that while Gujarat is interested in the tourists who are visiting Rajasthan, the neighboring state is willing to target the non-resident Gujaratis (NRGs) who come during the winter months to their home town. Tourism secretary Vipul Mittra said that the state has already entered into a memorandum of understanding (MOU) with Rajasthan and Karnataka for interstate tourists and also Punjab, which has a large number of NRI visitors and tourists. The senior bureaucrat added that the tour operators of both the states would meet regularly and would market the tourism sights from each other's states. While from Rajasthan, the state would be targeting foreign tourists, from Punjab the department will target religious tourists. He said that if Madhya Pradesh and Maharashtra tourism departments also tie into the promotion, the state would be in a position to offer the entire western part of India to any tourist as one single destination. "The MOUs will help towards mutual promotion of tourism, showcasing each other's cultural heritage to the tourists and felicitating inbound travel into the respective states," Mittra said. Officials from the tourism department said that according to the deal, the states would mutually market their accommodations and tourism packages. Sources said that next in line is Goa, where the state wants to promote wildlife and religious tourism along with beach tourism. Manish Sharma, president of the Gujarat Association of Tour Operators said that signing the MOU is in the interest of the state: "Rajasthan has been promoting Gir, and the effect is that schools from Rajasthan have visited Gir for watching the Asiatic lions. Tourists coming to Rajasthan come for heritage tourism, and the operators offer Gir, Somnath, and Buddha tourists together." Sharma said that this is a beginning and more and more tourists would be coming to the state in the near future. 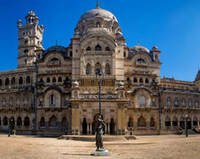 He said: "A person coming to a tour operator in Rajasthan is offered a joint package. Once he takes up the package, the operator in Rajasthan takes care of the tourist till he is in their state and later hands over the tourist to their counterpart in Gujarat who further plans his tour. It is a win-win situation for both the operators."